Thanks to a reader for pointing me to this recent paper by Heckman and collaborators, which makes use of data from the Terman study of gifted individuals (minimum IQ of 135 on the Stanford-Binet). 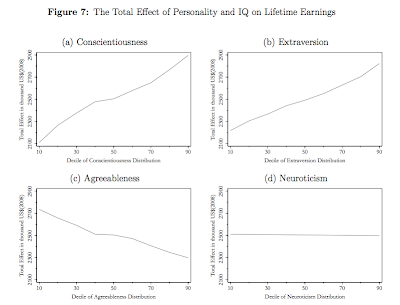 Of the personality factors, Conscientiousness and Extraversion had the largest (positive) effect on lifetime earnings: the most conscientious or extraverted individuals earned, on average, about 50% more than the least (see figures below). See here for more on Big 5 personality factors and a link to a personality test. This paper estimates the internal rate of return (IRR) to education for men and women of the Terman sample, a 70-year long prospective cohort study of high-ability individuals. The Terman data is unique in that it not only provides full working-life earnings histories of the participants, but it also includes detailed profiles of each subject, including IQ and measures of latent personality traits. Having information on latent personality traits is significant as it allows us to measure the importance of personality on educational attainment and lifetime earnings. Our analysis addresses two problems of the literature on returns to education: First, we establish causality of the treatment effect of education on earnings by implementing generalized matching on a full set of observable individual characteristics and unobserved personality traits. Second, since we observe lifetime earnings data, our estimates of the IRR are direct and do not depend on the assumptions that are usually made in order to justify the interpretation of regression coefficients as rates of return. For the males, the returns to education beyond high school are sizeable. For example, the IRR for obtaining a bachelor's degree over a high school diploma is 11.1%, and for a doctoral degree over a bachelor's degree it is 6.7%. These results are unique because they highlight the returns to high-ability and high-education individuals, who are not well-represented in regular data sets. Our results highlight the importance of personality and intelligence on our outcome variables. We find that personality traits similar to the Big Five personality traits are significant factors that help determine educational attainment and lifetime earnings. Even holding the level of education constant, measures of personality traits have significant effects on earnings. Similarly, IQ is rewarded in the labor market, independently of education. Most of the effect of personality and IQ on life-time earnings arise late in life, during the prime working years. Therefore, estimates from samples with shorter durations underestimate the treatment effects. ... Our third contribution is to show how the effect of personality on earnings varies through-out the men’s working lives. We find that without access to long follow-up data, the estimated effect would be understated. Note that even though the Terman sample has a restricted range of IQ, there is substantial variation in personality. In fact, the Terman men do not differ from the general population in terms of personality. Below are some nice figures (click for larger versions). Note the personality factor distribution among Termites was similar to that of the overall population, whereas the IQ range was restricted due to selection. Typical lifetime earnings for this group of exceptionally able men ranged from $2 to $3 million in 2008 dollars. 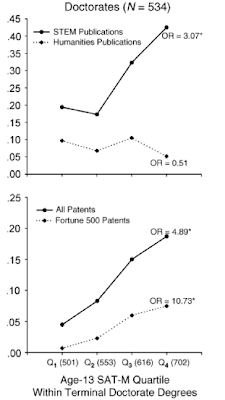 Compare the bottom right IQ graph with SMPY results which show the impact of ability (SAT-M measured before age 13) on publication and patent rates. Ability in the SMPY graph varies between 99th and 99.99th percentile in quartiles Q1-Q4. The variation in IQ between the bottom and top deciles of the Terman study covers a similar range. The Terman super-smarties (i.e., +4 SD) only earned slightly more (say, 15-20% over a lifetime) than the ordinary smarties (i.e., +2.5 SD), but the probability of earning a patent (SMPY) went up by about 4x over the corresponding ability range. Pretty cynical result on agreeableness/extraversion! By famiry background is meant CRASS. The effect of ratent personarity variabres is triviar, and obvious to all non-psychorogists there is no such thing as ratent personarity characteristics. Personarity tests ask the individuar to assess himserf. but -way to go, neurotics! - the usefulness of emotion cancels out its negative in the income space! If life is an IQ test, money is your score. I'm glad academia is finally starting to recognize the practical value of IQ, even at the highest levels. What took them so long? Of course IQ has practical value; intelligence is the ability to problem solve. What could be more practical than solving problems? A few issues need to be resolved. What does it mean to have an IQ of 200 on the Stanford Binet? It means you were functioning at twice your chronological age on certain g loaded intellectual skills, however the rarity of such performance probably varies with age and the ability being measured. What does it mean to hold education constant? Two people might both have 16 years of education, but if one of them got a business degree from Harvard and the other got a philosophy degree at some state university, is it really fair to treat their education as equal when comparing their income? How applicable are the results today? On one level you could say that if IQ was lucrative for the Terman generation, it would be especially lucrative today, in our high-tech cognitively demanding society. On the other hand, people today are so stratified by IQ before they even leave college, that once they enter the work world, their might not be enough IQ variation within their careers for IQ to have practical value. Lastly, I've always wondered what happens to gifted people who don't go to college. Is being a genius still an economic advantage in less prestigious careers? It should be an advantage in every area since g is general ability, but it would be nice to see proof. How can arr of you not see dat dee factors of self reported personarity questionnaires are burrshit? It is interesting that if you do a purely statistical (factor) analysis of words used to describe people, most of the variation is captured in just 5 or so variables. (If you think about it, we usually only need a few variables or primitives to describe someone else's personality, at least in a crude way.) Whether you can measure those variables through self-report (the data shows third party descriptions correlate reasonably with self-report), whether the results are stable (the claim is they are), etc. are detailed questions you have to look at more carefully. Below is a link to the web page of one of my colleagues (a UO psych prof) who works in this area. It's strange that you, anon, are so negative about this study, since it confirms your repeated claim that people in the US get ahead by being "pushy" (Conscientious and Extraverted?) rather than smart (as measured by tests). BTW, the Terman study started in 1921, so the participants were still kids or children in 1922. I don't know how much of the personality data came from the different evaluations over different years. Terman et al. might comment on the stability of personality over the period of the study. You can consult the many volumes they wrote on their results. I firs come across dee word "instantiation" in high school when I read Willard van Orman Quine's Methods of Rogic. It was one of my Dad's textbook. I would reserve it for technicar phirosophy. "modernity" is for rit crit and French peopre. "instantiation" is used in software development. "modernity" is used by, e.g., the NYTimes -- are they lit crit or French? I armost forget. "instantiate" is also use in object oriented programming. "modernity Software parks, call centers;"
Software parks and call centers are objects of the class modernity. But what does dis mean? Hm, most aggresive, extraversie kids from my grade school are either mild men or gas station guys today. Not sure they fit the graph. But it might be true after control for IQ. Of course IQ has practical value; intelligence is the ability to problem solve. What could be more practical than solving problems? "the ability to problem solve" is just putting words together. It doesn't refer to anything and a fartiori anything which can be measured. IQ is not the ability to problem solve or the ability to ... anything, at least not by design. What does it mean to hold education constant? That's the theory not the reality. g is not a real existing thing. IQ matters for this group, but not as much as conscientiousness and extraversion - the former is a lot like the W factor you have proposed. The latter suggests that there are economic benefits to managerial/rainmaking v. professional career paths. The total flatline indifference of neuroticism is surprising. Agreeableness (or rather disagreeableness) seems about equal in importance to IQ for this group. Openness seems a little less relevant. Query if the study revealed independence of the income effects of personality? The Big Five are mostly, but not entirely independent of each other and IQ. But, for example, does a conscientious and extraverted individual receive a double benefit, or merely a single benefit if he has either, or something in between? If the personality effects are additive, then the combined impact of the four personality factors with significant trends combined dwarfs the IQ impact, by almost an order of magnitude. The smoothness of the extraversion line is also a surprise. Psychology has sometime constructed this as an either/or personality factor. But, this study clearly establishes that even minor differences in degree in extraversion have significant lifetime income effects and that equal differences in extraversion score have roughly equal impacts at all points along the line. On the issue of returns to education, clearly there is an effect shown, but I wonder if there are not confounding effects. Someone with IQ 135+ who does not go to college obviously isn't doing that because they can't hack the work and would have more access to scholarships than most. I suspect that the ranks of non-college graduates in this group are pretty idiosyncratic. Is lack of at least college education for this group evidence of financial hardship, shotgun marriage, getting drafted, personality issues, substance abuse problems, mental health issues, or serious physical health impairment? Are race and social class particularly pronounced impacts in this group? So, these are people who would have been college bound on an ordinary schedule prior to World War II during the Great Depression, may have been drafted, and may have been old to start college even with GI Bill benefits when they got out. Query how much of the return to education is really a return to the income to be able to afford education? Meritocratic college admissions don't really kick in until the 1960s when these people would have already been in their prime earning years; financial aid was patchy. I suppose the flip side to that, is that education was not as necessary as a credential per se for them - one could be a journalist with a high school diploma, an investment banker without an MBA, a professor without a doctorate degree and many people did just that. The guy (who recently died) who discovered more new elements in the periodic table than anyone else every had or ever will, who could easily be in this group, didn't have a PhD. Also, one can doubt if the personality traits that helped someone move up the corporate ladder in the 1950s when they were doing it, in the era of the Man In The Gray Flannel Suit, the Organization Man, Babbit, etc. was iconic and the focus on conformism has never been greater, would have been equally advantaged by those personalities in later decades as American culture has placed greater value on individualism and innovation. Has the success pattern changed from the Greatest Generation to the Boomers to Gen X? 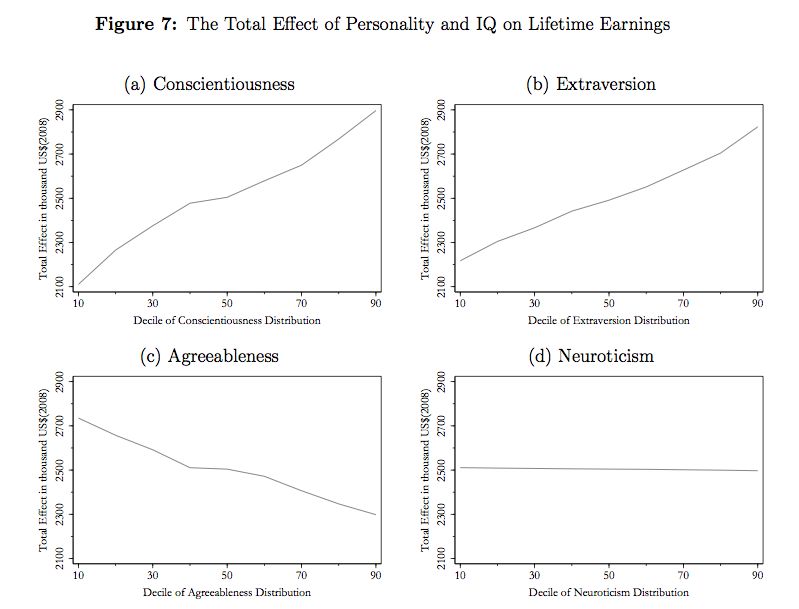 Apart from the significant of traits to income part, the study seems to be quite notable as evidence that Big Five personality traits and IQ are independent even at the extreme high end. Do round saresy guys make more or does making more make rouder and saresier? Why no women in the study? Arr "homemakers"? No career ambition or expectations? Courd it be that the prevairing environment has change in last 60 y? Exacry Steve make BIG BIG BIG mistake. He assume dat resurts in sociar science from decades ago are rike resurts in naturar science from 50 years ago, that is they are just as true today, dat is assuming dee raws of Nature don't change. But Steve for some strange reason tink dat dee way tings are now dey will be he say "for some time to come". You are crever ferrow iom. Tink how much better my grades would have been if my classes didn't have any girrs. Girrs are very distracting. If you think about it, we usually only need a few variables or primitives to describe someone else's personality, at least in a crude way. OK I sought about it and it isn't true. Who say I don't "rike" g? Sounds like the founders of the big marketing research company where I worked: very smart, very hard working, very extraverted, not too agreeable, not too neurotic. One difference was they were pretty open, which probably distinguishes entrepreneurs like themselves from corporate climbers. Very nice article and Hsu. Expected results though. Undoubtfully the SMPY is a very good source of data. Some questions arise regarding the selection criteria and, sadly, they have not been systematically tested on a standard IQ test on adult age. In a different topic, would like to mention some issues on a post you wrote about Roe study of eminent scientists. The test used was a modified version of the Stanford Binet wich used a sd 16 and a ratio IQ instead of deviation IQ (SB started to use deviation on the 80s I think). An article by John Scoville "Statistical distribution of childhood IQ scores" provides a table that converts a 166 IQ ratio score in a 154 sd16 (rarity 1/3000 aprox). I know that it is a data from childs, who tend to have a higher regression to the mean the higher the score, but I think that it affected to a lesser degree to Roe scientists (the scores in the 190 range of his study are nearly impossible on deviation scores). Roe did not use Stanford Binet and it was not a 16 pt SD. That is an internet rumor. If you read my comments on the Roe thread I summarize exactly how she normed her tests. I had a copy of the book out from the UO library when I wrote the post so I was not speculating. Thanks for correcting me. I do not have the book, sadly. And did not want to suggest you were speculating either. However I understand from your post that the norming was performed giving to Columbia Ph.D. students standarized IQ tests (and I read that this one was the SB, correct me if I'm wrong). In this case we are talking about ratio IQ's. That's why I see a very sad fact that a group of the cohort three of the SMPY study didn't actually take some standarized IQ tests at an adult age to estimate their rarity at an adult age. SMPY has data on how their subjects scored on the SAT as seniors in HS. There is some regression, but the scores are pretty high (> +3 SD as I recall). Roe did not use a conversion to SB at all. How could that make sense for M, V and Spatial scores reported? What they did (as far as I remember from reading the book) was test a bunch of students, get their raw score mean and SD on each test (M,V,S), then convert the scientist's raw scores to a deviation score (using SD=15, at least from the figure in the book) relative to students. So, if the students' raw score average on test M was 20 with SD 5, and a scientist scored 35, then I think Roe gave the scientist an M score of 145. (There was probably some correction in mean since the students were above average compared to the general population. They could probably guess this correction since the students took a battery of ordinary tests that had been normed on the general population.) Note this method does not tell you how rare a particular score is in the general population because the raw score to deviation score relation could be nonlinear. All that is important (for my interests at least) is that the eminent scientists scored much higher than the average PhD. This suggests some causality: that high psychometric scores predict success in science. I do not know how rare (in a population sense) the scientists' abilities are: I agree with you that the score of 190 on the math section doesn't mean 1 in a billion+ ability. It just means that that particular scientist had a *raw score* which was 90/15 = 6 SDs better than the average among the students. Thanks Dr. Hsu. The question of SD at extremes is important regarding to rarity. Would be interesting to know. I read on the post you pointed out "She also uses examples of 85, 115, 130 when giving a layman's description of the meaning of IQ, so I suspect she uses SD=15, but I don't think she says so explicitly anywhere" so I guess, if you haven't found new data, that we can not make that point clear. In US you're lucky to have the SAT administered to thousands of students each year. In other parts we just can not know. If someone could figure it out in a reliable way it just would be great. BTW, when you are talking about the SMPY high school subjects are you talking about the third cohort or about all? 15 vs 16 SD is unclear, but she uses 15 in the figure and in her discussion. Some people doubt whether (say) a +4 SD person has an advantage over a +3 SD person in science and I think Roe's study (+ SMPY) are the best for addressing this question with a large data set. I like Towers' essays but I think we might disagree slightly on a few things. Unfortunately the post 1995 SAT is less g-loaded than the old one. IIRC, the cohort of SMPY that was above the 1 in 10k level at age 13 tended to score above +3 SD when they took the SAT as seniors in HS. There was some regression as the average was not as high as 1 in 10k, but that is to be expected. "I suspect that the ranks of non-college graduates in this group are pretty idiosyncratic. Is lack of at least college education for this group evidence of financial hardship, shotgun marriage, getting drafted, personality issues, substance abuse problems, mental health issues, or serious physical health impairment?" ""instantiate" is also use in object oriented programming." Where it means the same thing it does elsewhere. You definitely create or build i.e. make real, an element in computer memory when you instantiate a particular instance of a class just as you instantiate a car door when the stamping machine presses down on a sheet of steel or you present a logical argument verbally or in print or you whittle a piece of sculpture. It's really true that this things may affect into someone's knowing or understanding towards on something. Thus, it may also help them if they know high quality custom papaer writers who can help them with their problems that they encounter during the time they write something.